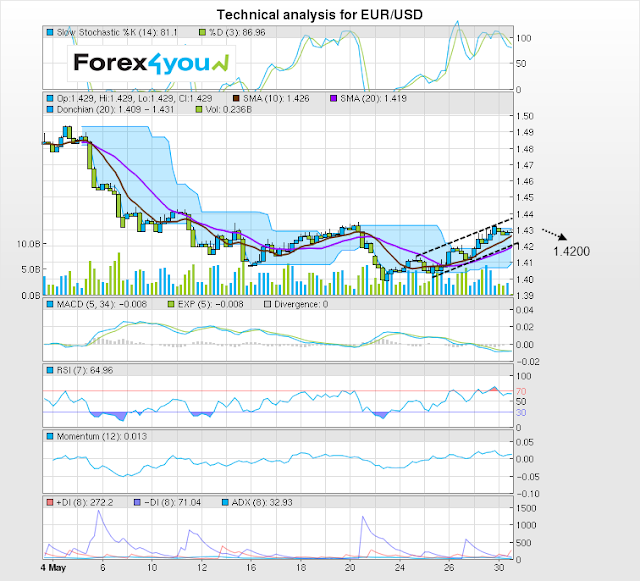 The EUR/USD is in a rising counter-trend rally. The more recent activity shows a dip forming which, if it continues, could fall back down to support at around 1.4200, provided by the lower channel line of the move up. The 0.005x3 point and figure chart highlights the importance of key resistance at 1.4300 with a possible treble-top buy signal setting up. The 0.001x3 is also bullish with its very high 1.2700 target, however, the smallest box size chart is bearish with a down target at 1.4200. One interpretation might be that there is a strong likelihood of a pullback to 1.4200 before a move higher.